The testing profession isn't easily mastered, and isn't something that can be perfected by practice alone. Good testers study testing to improve their knowledge of the areas they know about, but great testers strive to find out about areas of software testing they don't yet realize they don't know about. Fresh ideas can provoke us into discovering great insights: Six thinking hats did just that for Julian Harty, who then applied them to software testing with great success. He, and tens of others, has found the thinking hats easy to use, practical, and very productive. Read on to find out how you can apply them to your work. Self-organizing teams still need managers. 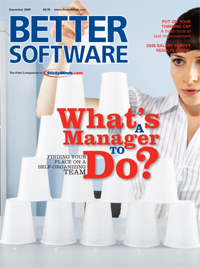 But those managers need to rethink how they do their jobs and consider how much self-management the team can take on. Finding the sweet spot between hands on and hands off is the key. Conflict reduces people's productivity and generosity toward the organization and their coworkers. These four steps can help defuse a conflict situation and improve the chances for a solution that at the least, both parties can live with. An oft-overlooked goal of encapsulation is to simplify usage. Without this sensibility, classes can end up with simplistic interfaces and callers can end up with method-call pile-ups.